Tirta Empul Temple or Tampak Siring Temple is a holy spring water temple located in Tampak Siring Village, Gianyar regency and is about 39 km eastwards from Denpasar town. It is set in the dale and encircled by the hill. In the west side of this temple, there is an Indonesian President palace which has been found by the first president. The name of Tirta Empul is loaded in a inscription which is kept at Sakenan Temple, Manukaya village, subdistrict of Tampak Siring, about 3 km from Tirta Empul Temple. In this inscription, the Tirta Empul is named by the Tirta Ri Air Hampul and then the name has changed into Tirta Hampul and finally become the Tirta Empul. Tirta Ri air Hampul is meaning the water emerge or the holy pool which is the water emerge from the land. It is believed that it is the infinite creation. 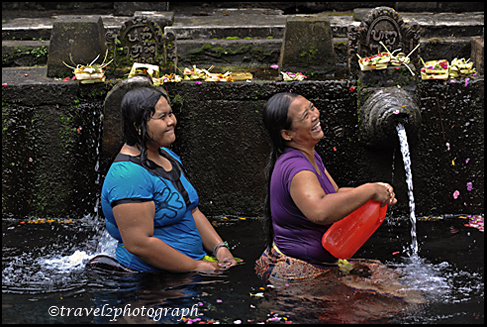 At the moment this pool water is sanctified by the Hindu society in Bali and they believe that this water source can heal various of diseases, hence every day this place is visited by a lot of Hindu people to do the ritual and sanctify them self . This place has been opened for public and became a famous tourist destination in Bali.